What is Microsoft Inter-mediate Language (MSIL) code in .Net? Learn: What is MSIL (Microsoft Inter-mediate Language) Code in .Net, how MSIL converts the code into equivalent common code, so that .net framework understands the code. There are many languages used in .NET Framework. For each language a different compiler is used for compiling the source codes. 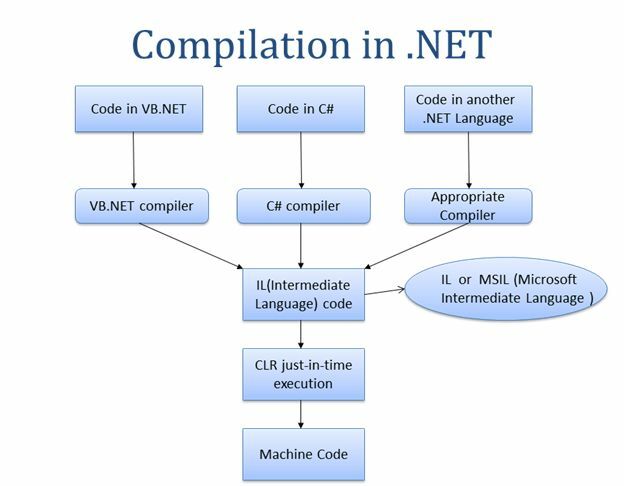 In .NET Framework’s each compiler converts source code into an intermediate code is known as Microsoft Inter-mediate language code. The advantage of MSIL code is: it can be consumed by any other .NET compatible language. The MSIL code is common for all languages and is understandable only to .NET environment. MSIL code is also known as CIL (Common Intermediate Language) code. Due to MSIL code .NET Framework achieves language inter-operability. Here, Language inter-operability means one module of project is developed in c#, it can be consumed in VB.NET. Thus, .NET framework is also known as language independent.